The University of Wisconsin–Stout is hosting two international students from Sweden on their men’s hockey team: freshmen Gustav Girborn and Fabian Hellgren. Girborn is a Business Administration major from Tyreso–a suburb just outside the capital city of Stockholm–and Hellgren who already has a bachelor’s degree in Supply Chain Management from the University of Skovde and is from a suburb three hours south of Stockholm called Hjo. Hellgren plays at the forward position, saying it doesn’t matter whether he plays center, left or right, making him a very versatile player. After receiving his bachelor’s, Hellgren was unsure what he wanted to do in the next phase of his life. While attending the University of Skovde in Sweden he met Marika Andersson, a Stout student who talked to him about studying abroad. The thought of it interested Hellgren and slowly but steadily he decided that was the path he wanted to take. Girborn plays as a goaltender here at Stout. His ambition was to play junior hockey here in the states, but his plans turned around when he received an email from Coach Watkins asking if he would like to join the team in the upcoming season. Girborn had no prior commitments to any Swedish teams and agreed without hesitation. Girborn sees a big difference in the way hockey is played here in the U.S. and how it is played in Sweden. “There are smaller rinks here so the players crash the net a lot harder, where in Sweden we sort of work the puck around.” Girborn says that the length of the rinks are the same between Sweden and the U.S., but it’s the width that differs with Swedish rinks being a full 12 feet wider. 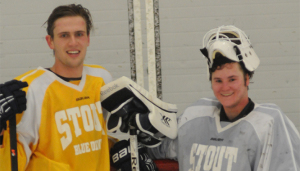 Both Girborn and Hellgren have been playing hockey since they were young. Girborn’s father was a goalie coach for an elite team back in Sweden so he grew up watching the game and played on the same youth team from the ages of five to 16. From there he went on to play in the top tier junior league, and would continue to play three years of Division I hockey in Sweden. Hellgren has been playing since he was eight years old and played with the same club team for four years. From there he went on to play high school and eventually played Division II hockey in Sweden. Hellgren and Girborn both agree that the thing they miss most about home is their families, but being with the team makes them forget all about it. Blue Devil men’s ice hockey is set to kick off their season away at Lake Forest College at 7 pm on Nov. 1.